Is this a Red-tailed Hawk? Its exciting for me to catch this one. Its my first raptor. The birds here are so skittish. its hard to get a good-quality pic. There was a black-looking bird dive-bombing it relentlessly. The hawk barely noticed, if that helps identification. 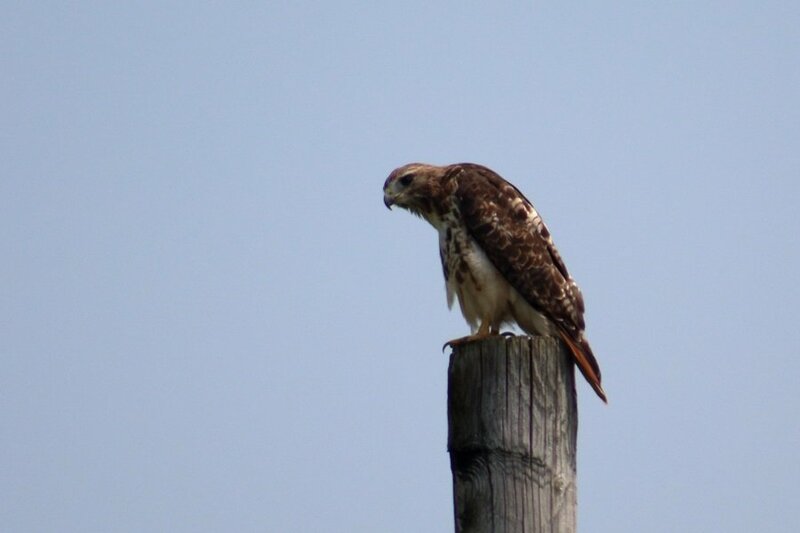 Definitely a Red-tailed Hawk, an adult with the red tail and dark eyes. The band of streaks across the belly is also a good ID mark. If you have some time and want to see more raptors, there are three hawkwatches in the area that are going to be starting up soon. Illinois Beach SP starts next Saturday, Fort Sheridan Forest Preserve may have already started, and Greene Valley starts September 1. The first two are along the lakefront in Lake County, the other one at the south end of DuPage County. All three meet every day during the fall, and they all have volunteers who love to help out beginners (unless it's really busy, in which case there's usually other people around as well). The access to Greene Valley is tricky, so DM me if you're hoping to try that one. My apologies for dropping off for so long. I get a bit busy sometimes. That is something I would love to do. I'm looking for an interesting opportunity like this during the fall. I'll look into these areas and I will let you know if I need some help. Thank you very much for the information. I did not know things like this even existed. Beautiful Red-tailed Hawk. Great photo!